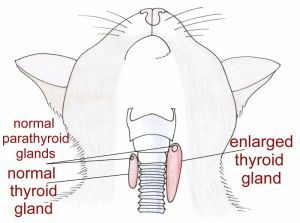 The thyroid gland consists of two lobes and is situated in the neck - one each side of the trachea (windpipe). It produces thyroid hormones that are essential for growth and development of cells in the body along with a wide range of metabolic processes including the process of turning food into energy. Hyperthyroidism is a common disease in middle aged to older cats in which there is an overproduction of thyroid hormones. This is most commonly due to a benign (non-cancerous) enlargement of one or both thyroid lobes called an adenoma. 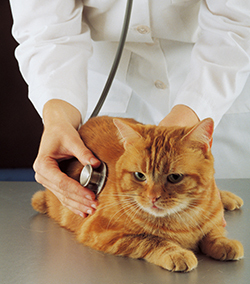 An owner may think that their cat’s symptoms are down to them ‘just being old’ but on examination by the vet, they often have an increased heart rate and the thyroid gland can be felt due to it being enlarged. Following a clinical examination where hyperthyroidism is suspected, a blood test is required to confirm this. The test measures the concentration of thyroxine in the blood and a raised result indicates an overactive thyroid. This common disease, in most cases, can be successfully treated and your vet will discuss the best option for your cat. The aim of the treatment is to bring the levels of thyroid hormones in the blood back to normal. The options are medication, a prescription diet, surgical removal of the enlarged gland/glands or radioactive iodine therapy. Hyperthyroidism is a treatable disease. Without medication or surgery an affected cat deteriorates, becoming extremely thin and weak and may eventually develop heart failure. 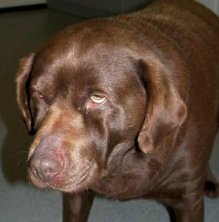 Hypothyroidism is a condition seen in middle-aged - older dogs which results from an underproduction of thyroid hormones from the thyroid gland. This leads to a decrease in the metabolic rate, usually leading to weight gain (with no increased appetite), generalised lethargy and weakness and loss of interest in playing and interaction with their owners. Other signs often include coat problems (patchy hair loss or excessive shedding) and recurrent skin / ear infections. The condition is usually diagnosed by a combination of clinical signs and blood tests. Finding a lower than normal level of thyroid hormone (thyroxine) in the blood can point towards hypothyroidism although additional tests may be required to confirm the diagnosis as some other conditions can affect thyroid hormone level. Once diagnosed the good news is that it is easily treated. Treatment consists of putting the dog onto tablets of a synthetic thyroid hormone called thyroxine (levothyroxine). This will be a lifelong medication. Response to the medication is gradual, with some signs such as activity and attitude improving as soon as 7-10 days after treatment begins. Other signs, such as improvement in skin and coat condition may take 6-8 weeks. Thyroid hormone levels are re-evaluated periodically by a blood test and the dose may need to be adjusted. Hypothyroidism is not life-threatening, but if left untreated dogs can become overweight & lethargic, with a poor quality of life.